I'm going to admit something now that will probably result in the National Trust cancelling my membership; I didn't really like that Michael Buerk ITV programme, Inside the National Trust. 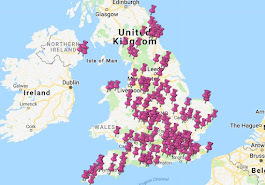 It wasn't the actual NT properties that I didn't like - I first saw Sizergh Castle on there and it went straight onto my wishlist. No, what I disliked is the thing that gets on my nerves with any TV programme these days - the way it introduces you to the subject ("Jim works at Boggins Castle, which was built by William The Conquerer and was the wedding venue for Wayne Rooney") before moving on to something else and then coming back to repeat everything ("Back at Boggins Castle, which was built by William the Conquerer and was the wedding venue for Wayne Rooney...") until you want to kick the TV in and scream "I KNOW! I WAS WATCHING 3 AND A HALF MINUTES AGO WHEN YOU LAST TOLD ME!" But let us not kick the TV in. Let us instead be calm and grateful to Mr Buerk for enlightening us about Sizergh Castle. 1. Nearly 800 YEARS with the same family! Sizergh has been connected to the Strickland family since 1239. That's astounding. I'm proud of myself for having maintained a mortgage for 5 years without anybody sending the bailiffs round. But 800 years! It's impressive because the family didn't have it easy. They were Catholic and Royalist and basically always seemed to be on the wrong side of things. But they were also very clever and somehow managed to retain control of Sizergh. I was surprised at how relatively small the cafeteria was - I couldn't imagine it coping with hundreds of visitors on a Saturday. 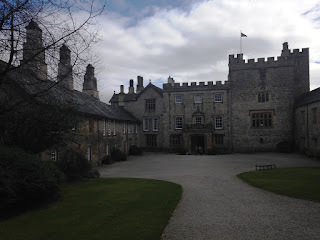 But Sizergh Castle itself isn't open at weekends, as the family don't allow it. This normally drives me bonkers, but I will say this: one thing that Sizergh has in spades is homeliness. I've visited many NT properties with a no photography rule "because it's a family home" and you look around at all the priceless objects and furniture and think "REALLY? People ACTUALLY live in here? I don't think so." Sizergh isn't like that - you can genuinely imagine people traipsing in and shouting "What's for tea?" It's the homeliest castle I've ever seen. In the same way that I knew very little about Charles II until I went to Moseley Old Hall last year, I knew pretty much nothing about the Jacobite Rebellion until I went to Sizergh. James II came to the throne in 1685, following his brother, Charles II, who had no legitimate heirs. James was Catholic and there had been efforts to stop him becoming king, which had failed. The Stricklands were fans of James - Lady Strickland was under-governess to the Prince of Wales - and so they went into exile in France with him in 1688 when he was deposed and replaced by William and Mary. 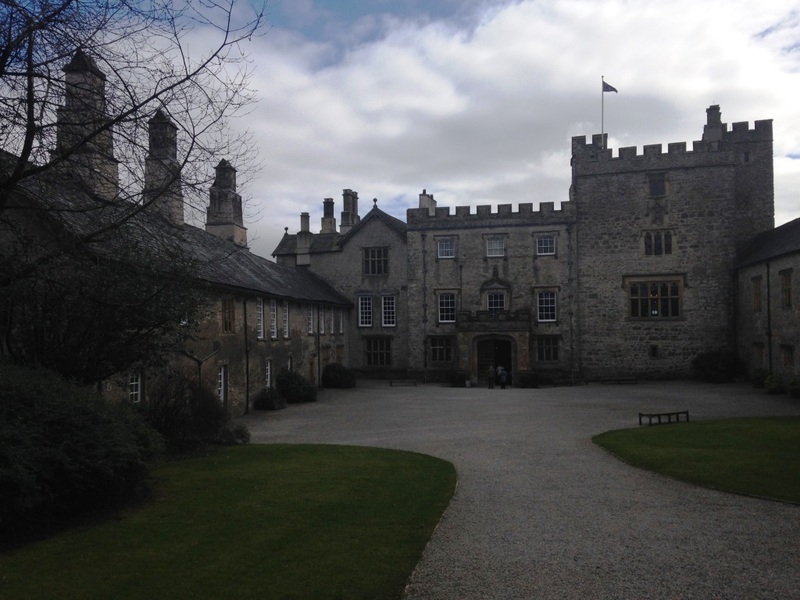 Sir Thomas left Sizergh in trust with two family servants so it couldn't be seized by the new monarchy. The Stricklands eventually returned to England, but remained loyal to the Jacobite cause when James III moved to Rome. Strickland cousins were part of Bonnie Prince Charlie's army when it marched through nearby Kendal. I always love properties with excellent room guides and at Sizergh they have Betty. She was brilliant. "Have you been here before?" she asked. "Would you like a potted history?" and without any further messing about she gave us the background. Sizergh wins the award for Most Unexpected Item on Display at the National Trust Ever. 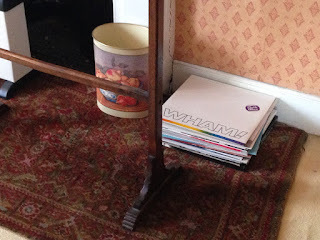 I can't remember which room this was in, but there it was: a Wham! double album. I spent the rest of the day thinking of suitable Wham! scone tracks (Club Sconeicana, I'm Your Scone, Bad Scones being my three favourites). I really wanted to rifle through the pile and see if there was any Johnny Hates Jazz, but I restrained myself. 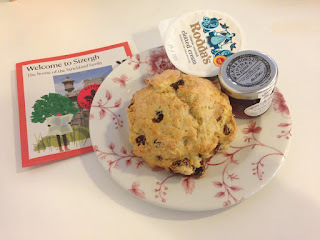 This was my 113th National Trust scone and my expectations were low. I very rarely get two excellent scones on the trot and the Wordsworth House scone yesterday had been spectacular. But the Sizergh scone was excellent too. It was freshly baked and tasty and gets top marks. 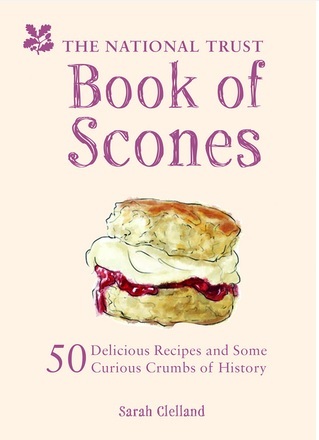 It's only a matter of time before the BBC calls me up and ask me to front a major documentary on scones of the National Trust - I promise I won't allow them to keep repeating the facts.